USDA, TDA: More Food Help on the Way for Households Hit by Harvey. USDA Office of Communications. WASHINGTON, Sept. 7, 2017 – Families affected by Hurricane Harvey will soon be able to receive food packages containing nutritious, high-quality foods–100 percent grown and produced on farms in the U.S.–known as USDA Foods, the U.S. Department of Agriculture, and Texas Department of Agriculture announced today. Agriculture Secretary Sonny Perdue said the food boxes families will receive are a short-term measure designed to address an immediate need for food until a longer-term solution is ready to be put in place. The Disaster Household Distribution program is approved to start on Sept. 8. The Texas Department of Agriculture will work directly with its partners, the Feeding Texas and local food banks, to issue food boxes to participants located in presidentially declared disaster areas. The food banks will utilize their current network of pantries to distribute foods in areas affected by Hurricane Harvey. Each of the packages will contain 25-30 pounds of USDA Foods and will be based on existing shelf-stable items in identified food banks. For more information on the program, please visit: www.squaremeals.org or contact: HarveyInfo@texasagriculture.gov. CLICK THE FIRST LINK ABOVE FOR THE COMPLETE PRESS RELEASE. We are proud and honored to have Dr. Marc Bekoff on our next show. Marc Bekoff is professor emeritus of Ecology and Evolutionary Biology at the University of Colorado, Boulder, and is a Fellow of the Animal Behavior Society and a past Guggenheim Fellow. In 2000 he was awarded the Exemplar Award from the Animal Behavior Society for major long-term contributions to the field of animal behavior. Marc Bekoff is co-founder with Jane Goodall of Ethologists for the Ethical Treatment of Animals. Marc’s work has been featured on 48 Hours, in Time Magazine, Life Magazine, U.S. News and World Report, The New York Times, New Scientist, BBC Wildlife, Orion, Scientific American, Ranger Rick, National Geographic Kids, on NPR, BBC, Fox, NaturGEO, in a National Geographic Society television special (“Play: The Nature of the Game”), Discovery TV’s “Why Dogs Smile and Chimpanzees Cry,” Animal Planet’s “The Power of Play,” National Geographic Society’s “Hunting in America,” and more recently in “What Animals Think” and PBS Nature’s “Why We Love Cats and Dogs,” “Animal Odd Couples,” “My Bionic Pet,” and “Animal Reunions.” Marc has also appeared on CNN, Good Morning America, and 20/20. Please join wolfdog Radio for this very special Interview with Dr. Bekoff! Wolfdog Radio will also feature a personal and live interview with our very own Jerry Mills of the Tejas Den. What personifies character and greatness is not only coming back from one tragedy but to rise again like a phoenix from the ashes of another. Jerry Mills is is such a man. He will chronicle his experience and share with our listeners one man’s battle with the elements. The Center for Biological Diversity today filed a notice of intent to sue the U.S. Fish and Wildlife Service for violating the Endangered Species Act by never providing a comprehensive recovery plan for gray wolves nationwide as the law requires. Today’s notice calls for a national wolf recovery plan. According to the Endangered Species Act, wolves must remain protected until the Fish and Wildlife Service implements such a plan. Instead, this summer the agency announced plans to strip federal protection from wolves in the lower 48 states. That would make them vulnerable to trophy hunting and trapping, halting their progress toward recovery. The Service expects to publish a proposal to remove wolf protection by the end of the calendar year. A recovery plan would enable wolves to establish viable populations in areas where small populations are still recovering, including California, Oregon and Washington. It would also promote recovery in areas like the southern Rockies, Dakotas and Adirondacks, which have suitable wolf habitat but no wolf populations. The notice explains that the Service previously denied the Center’s formal petition requesting development of a national wolf recovery plan. Beyond a national plan for recovery, the Endangered Species Act requires the agency to conduct a status review every five years. But six years have passed since the last national wolf status review. WolfDog Radio was proud to have on our show author and friend – Nick Jans. This is the man who knew and loved Romeo. I could go on and on..but here him read from his book “A Wolf Called Romeo” and here the story from his own mouth. Today, the American Heartworm Society (AHS) released a revised version of its highly regarded canine heartworm guidelines—the first update since 2014. Reducing disease transmission, clarifying testing recommendations, and avoiding treatment shortcuts are priorities in the new guidelines. Based on the 2016 Triennial Symposium of the AHS, as well as new research and clinical experience, major changes to the guidelines include the following. According to Dr. Rehm, the incidence of heartworm disease in the United States and its territories rose by 21% between 2013 and 2016. Prevention is the cornerstone of any practice’s heartworm management program, yet compliance continues to be problematic and is believed to be 1 of the key roadblocks to reducing incidence rates. 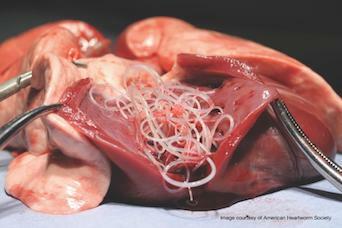 Heartworm: Where Are We Today? Year-round use of macrocyclic lactone (ML) preventives and environmental control of mosquito populations continue to be the basis of prevention, but AHS now recommends the use of Environmental Protection Agency–approved mosquito repellents/ectoparasiticides to control the mosquito vector and reduce heartworm transmission in high-risk areas. Instead, the guidelines recommend that veterinarians consider heat treating serum when circulating microfilariae are detected or when active clinical disease is suspected but an antigen test has returned a negative result. While no changes were made regarding the best treatments for canine heartworm, AHS is using the updated guidelines to double-down on its stance that the society’s current protocol remains the best method for successfully and safely treating infected dogs. To view the updated guidelines, as well as the AHS feline heartworm guidelines, visit heartwormsociety.org. Politicians are working to delist wolves in Wisconsin, Minnesota and Michigan listen to WXRP by Ken Krall and Rachel Tilseth on the House Bill. Let’s save the Gray wolf because he/she saves us (human-kind) in the end. In the past, less than a hundred years ago, vast herds roamed throughout the planet. The vast herds were wiped out by trophy hunting & human encroachment, and now live in small pockets of wilderness surrounded by human settlements. In these small pockets animals are forced to share habitats, and just think about the consequences of different kinds of ticks eating & spreading disease all on the same animals; Animals that are isolated in pockets of wilderness surrounded by human settlements. • Anaplasmosis, caused by bacteria, can be fatal in about 1% of cases, even in previously healthy people. • Babesiosis is caused by microscopic parasites that infect red blood cells and is treatable. The tick that transmits it is about the size of a poppy seed. • Colorado tick fever is a viral infection transmitted from the bite of an infected Rocky Mountain wood tick, which lives in the western United States and Canada in areas 4,000 to 10,000 feet above sea level. This disease has no treatment. • Ehrlichiosis, caused by bacteria, appears with flu-like symptoms. It is treatable has been fatal in about 2% of cases. • Powassan disease, which comes from a virus, has no specific treatment for the virus. Although only 75 cases have been reported in the past decade, it can develop into encephalitis, an inflammation of the brain, or meningitis, an inflammation of the membranes around the brain and spinal cord. • Q fever comes from a bacteria that naturally infects some animals such as goats, sheep and cattle, so ticks that feed on an infected animal can transmit the disease. Only about half the people who get Q fever will have symptoms, but those people can develop pneumonia or hepatitis. • Rocky Mountain spotted fever, caused by bacteria, can be transmitted via at least two types of dog ticks and Rocky Mountain wood ticks. The disease can be severe or even fatal if not treated within the first few days of symptoms that include headache, fever and often but not always a pink, non-itchy rash that starts on wrists, arms and ankles. • Southern tick-associated rash illness has an unknown cause, but researchers know that lone star ticks transmit this disease that can act like Lyme disease but isn’t caused by Lyme’s bacteria. An antibiotic can treat the symptoms. • Tick-borne relapsing fever, a bacterial infection, also can be transmitted via lice. The rare infection is usually linked to sleeping in rustic rodent-infested cabins in mountainous areas, but if not treated victims can face several cycles of three days of 103-degree fevers, headaches and muscle aches and a week without. • Tick paralysis, thought to be caused by a toxin in tick saliva, is rare but can paralyze a victim and is often confused with Guillain-Barre syndrome or botulism. Luckily, within 24 hours of removing the tick, the paralysis typically subsides. The planet needs Canis lupus (Gray wolf) and other large carnivores. Large carnivores can detect diseased and weak animals. The U.S. House earlier this month passed an appropriations bill that has language in it changing the status of the gray wolf from federally protected to delisted in the lower 48 states. This movement has been asked for by people who want to control the wolf population in the Great Lakes states, but has alarmed an advocate who wants to keep federal protection of wolves. Congressman Sean Duffy and both Wisconsin U.S. Senators, Ron Johnson and Tammy Baldwin, have called for delisting. Last summer, a federal appeals court retained federal protection for gray wolves in the western Great Lakes region, ruling the government made crucial errors when it dropped them from the endangered species list five years ago. Some hunters and farmers have called for the delisting to control the wolf population and to remove wolves taking livestock. Wolf de-listing advocates say the population has grown too large and should be controlled. Recent reports find the number of wolves in Wisconsin leveling off. This year’s wolf count shows there are between 905 and 944 wolves in the state. That’s about a 2 percent drop from last year. Anti-wolf Politicians in Congress are working to delist wolves in the 48 contiguous States of the United States even going as far as preventing any judicial review of this process. These politicians are undermining the Endangered Species Act itself! On June 6, 2018 The U. S. House of Representatives passed a Bill: Making appropriations for the Department of the Interior, environment, and related agencies for the fiscal year ending September 30, 2019, and for other purposes. (1) shall not be subject to judicial review; and 63 ther republished on May 1, 2017 (82 Fed. Reg. 20284) that reinstates the removal of Federal protections for the gray wolf in Wyoming under the Endangered Species Act of 1973 (16 U.S.C. 1531 et seq. ), and this subsection, shall not be subject to judicial review. (b) Before the end of the 60-day period beginning on the date of enactment of this Act, the Secretary of the Interior shall reissue the final rule published on December 9 28, 2011 (76 Fed. Reg. 81666), without regard to any other provision of statute or regulation that applies to issuance of such rule. Such reissuance (including this sub-section) shall not be subject to judicial review. SEC. 117. (a) Not later than the end of fiscal year 2019, and except as provided in subsection (b), the Secretary of the Interior shall issue a rule to remove the gray wolf (Canis lupus) in each of the 48 contiguous States of the United States and the District of Columbia from the List of Endangered and Threatened Wildlife in section 17.11 of title 50, Code of Federal Regulations, without regard to any other provision of statute or regulation that applies to issuance of such rule. 2) shall not affect the inclusion of the subspecies classified as the Mexican gray wolf (Canis lupus baileyi) of the species gray wolf (Canis lupus) in such list. Contact your members of Congress and make it known that you want Gray wolves in the United States to remain protected under the Endangered Species Act. ◦U.S. Senators—Get contact information for your Senators in the U.S. Senate. ◦U.S. Representatives—Find the website and contact information for your Representative in the U.S. House of Representatives. Take action today to save Gray wolves!